"Spots found on the face are usually harmless (moles, seborrhoeic keratoses) but they can be a cosmetic problem, especially when there are a lot of them. Face spots may be brown, dark brown, black, red or white and they may be due to different causes. Since the face is exposed to many environmental factors like sunlight, pollution, and microorganisms, it is vulnerable to problematic skin changes. Treatment of these common problems depends on the cause, which is often easily diagnosed with the help of a dermatologist. See a Doctor if you notice any changes to spots on the face or if you see anything that is unusual." Harmless Spots on Face caused by Seborrhoeic keratoses (left) and a Mole (right). Acne which includes pimples can leave pink or red-colored spots on the face. 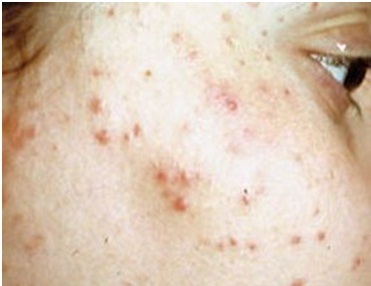 Acne is usually caused by clogged pores, bacteria and excessive oil. Some cases are mild, but others can be severe, which may leave acne marks or scars long after pimples have healed. Acne can cause spots on the face, neck, back, and chest when dead skin cells cling to each other and block the pores. Post-inflammatory skin changes due to insect bites, chicken pox and trauma (injury). Red Face Spots Due to the Virus Varicella-zoster, otherwise known as chicken pox. Age spots (also called solar lentigines or liver spots) are due to prolonged and repeated exposure to sunlight. Ultraviolet exposure increases the production of melanin, a brown pigment produced in the deeper layers of the skin, which can result in the appearance of spots on face. Age Spots (also called lentigo or solar lentigo) are caused by a genetic disposition and sun exposure. It is harmless. Prevention involves the use of sunscreen. If age spots are growing quickly, have an irregular border, are red tender or bleeding, or are very dark or black, see your Doctor for a skin check. Brown spots on face caused by age spots. It is also referred to as hyperpigmentation when you have an excess of melanin in the skin. onion juice: studies show onion extract helps to remove scarring on the skin and reduces skin lesions. apple cider vinegar: contains alpha hydroxy acids that help to remove dead skin. Melasma spots are similar to age spots or hyperpigmentation. They cause large areas of dark skin to appear. It is usually caused by hormonal changes, such as during pregnancy. It can also be a side effect of birth control pills. Tinea versicolor, a fungal infection caused by Pityrosporumovale. This skin infection is a chronic condition that can leave spots on face that are reddish-pink to white in color. Moles and skin tags usually grow as raised brown spots on the face. Moles in particular need to be differentiated from skin cancer or melanoma if they change in appearance. Watch moles to see if they have changed. If they do, have the mole checked by a dermatologist. Skin Tags (also called acrochordon or fibroepithelial polyp) can cause light brown face spots. They are small pieces of skin and are found in the groin, armpits, neck and armpits. The vast majority of cases are harmless. They can be removed for cosmetic reasons for if they cause discomfort due to friction with clothing. There is a higher incidence in over weight people or where the condition is possibly inherited. 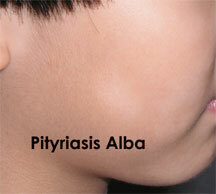 Dr. Rasya Dixit reviews causes of white spots on the face and how to get rid of the problem. Pityriasis alba is a chronic skin condition that is similar to eczema and commonly affects young adolescents and children. The skin spots are usually dry and scaly. It is more frequently seen during the summer and in families that have a history of eczema, allergy or asthma. It is an inflammatory skin disease that usually disappears by age 30. It may cause a mild itch that can be treated with PraxLotion . Moisturizer can address and dry skin patches. Patients with this disorder should use sunscreen to prevent the patches from becoming more pronounced. To get rid of this problem, trying using a PH balanced gentle face wash, use a water based moisturizer and a broad spectrum sunscreen. Hormonal changes can cause skin discoloration that can appear as large brown spots on the face. These may be due to the intake of hormones, birth control pills or pregnancy. Seborrhoeic keratoses is a skin spot that appears like it is sitting on the top of the skin. Its' color varies from black to orange or brown. The size is several centimeters wide. Most individuals get one or two of these spots before age 60. Sunspots are an indication that you might be prone to skin cancer The spots on the face can be flat and red in color. They may scale from dry skin and sting when scratched. They are primarily seen in people over age 40. Melanoma refers to cancerous skin moles. If it not treated is con spread to other parts of the body. A melanoma will appear as either a new spot on the face or a skin spot that changes in shape, size or color. See our guide to examining the ABCDE's of a skin mole. Other types of skin cancer are nodular melanoma, basal cell carcinoma and squamous cell carcinoma. Cancerous spots on the face due to Basal cell carcinoma (far left), Nodular melanoma (center) and Squamous cell carcinoma (right). The diagnosis for spots on face is easily made by a physician upon taking a medical history and a physical examination. Laboratory tests such as skin biopsy or blood tests may be done if the spots are suspicious for cancer. Spots on the face that are due to acne or other post-inflammatory changes usually appear as reddish to dark brown discolorations that may be accompanied by scarring and pitting. Skin changes may evolve within six to twelve months after the initial lesion has healed. 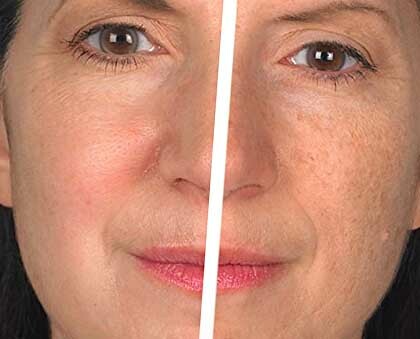 Brown spots due to aging usually appear after the age of 40 and are common among fair-skinned individuals, but they can also be seen in people with dark skin. These spots may appear as small freckles although they may clump together, making the spots appear bigger. There are no other symptoms, associated with age spots. Spots due to Tinea versicolor have sharp edges and fine scales, and they may be accompanied by itching and sweating. Moles and skin tags are usually harmless and unaccompanied by other symptoms, unless they are located in areas that may be irritated or scratched. One must be aware that when these spots become irregular in shape, size, and color, or undergo rapid changes accompanied by bleeding, one must consider skin cancer or melanoma. Face spots due to Pityriasis alba are round or oval and usually start as red or pink blotches, that eventually dissipate and are replaced by white patches which are flaky, scaly and itchy. Dark patches associated with hormonal changes may disappear after the delivery of the baby or after hormones are discontinued. No other symptoms are experienced. Treatment for spots on face depends upon the cause and diagnosis. Some of these spots may be difficult to treat and therapy may take more than a few weeks. Although there are many over-the-counter products that can help improve these discolorations, it is best to seek dermatological advice. Treatments may include topical skin care products to improve skin color, drugs to treat infection, clinical procedures like phototherapy, chemical peeling, microdermabrasion, and laser treatment. Many prescription and over-the-counter products use hydroquinone as the active ingredient. Prescription products have 2x the amount. For more chronic problems, a Doctor might prescribe a cortisone cream or a cream with tretinoin. Products that contain hydroquinone are used to get rid of brown or dark face spots. In this picture the hydroquinone product MD complete was used to clear face spots (left). You can see before use of the product on the right. Popular over the counter dark spot correction products include MD Complete and Pure Hyaluronic Acid Serum. Laser treatments are also used to remove spots on the face (ruby and q-switched lasers). Many types of face spots are caused by the sun, so use sunscreen that blocks both UVA and UVB rays. One day in the sun can reduce the effects of being treated for months.